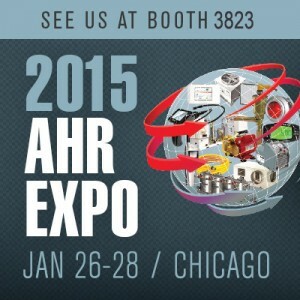 Hope you're just as excited about the 2015 AHR Expo as we are! Back in March of 2014, AHR was predicted to be right on record-setting pace. Guess what, they set multiple records. The three day event, sponsored by ASHRAE and AHRI, will have over 40,000 attendees will visit with over 2,000 featured exhibitor. We've searched the web for the most helpful resources, guides, and tips to the 2015 AHR Expo so you can get the most out of the biggest HVAC/R event in the world. You'll want to have this guide available on a device at all times during the 2015 AHR Expo. This 34 page digital flip book has a compiled list of all featured exhibitors and their booth number, so there's no guessing where your favorite HVAC company is located. Seemlessly search through the alphabetically organized index, so that you spend less time worrying about finding booths and more time enjoying the expo. "2015 Expo to Feature More Than 120 Education Program Sessions"
Not only does the 2015 AHR Expo feature exhibitors at their annual trade show, but educational sessions are available to attendees. You won't be able to find another program that this kind of exposure to industry technology, trends, and informational tools. There are over three-dozen free courses, and two-dozen paid courses, along with 60 exhibitor new product presentations. Not only are there free courses offered, attendees can even view exhibitor presentations that feature the latest innovative HVACR technologies in the AHR Expo in the New Product & Technology Theaters. These don't require ahead of time registration, unlike most other education program sessions. "2015 AHR Expo Show Preview"
The AHR Expo released a complete guide to the three day event that comes in flip book form that allows for mobile access during the show. The 2015 Product Preview divides featured products by category, which enables viewers to quickly search for the specific industry that interests them. Next, the flip book walks you through the different free educational programs offered, whether its an AHR Expo Sponsored Session or an Endorsed Associations hosting the session. Information on ASHRAE's Half-Day Short Courses and Full-Day Professional Development Seminars are also listed so that attendees can reserve their spots ahead of time. The comprehensive guide offers travel tips and information so that AHR Expo first timers can become experts at navigating Chicago and the different opportunities available. CLICK HERE to discover Setra's new lineup of products to be featured at the AHR Expo. Chris Brooks is the Director of Marketing at Setra Systems, Inc., responsible all marketing activity and strategic planning for Setra Worldwide and Dolan-Jenner Sales. Prior to joining Setra, Chris worked in marketing for Green Ray LED, an LED light manufacturing company, where he focused on helping Green Ray expand throughout emerging markets. Chris holds a Masters of Business Administration from the University of Virginia’s Darden Graduate School of Business and a BA in Political Science from Yale University.